Columbia Tower: This is not included in the City Pass. Fees depend on your age and status as a student or military. For most adults, the fee is $14.75. 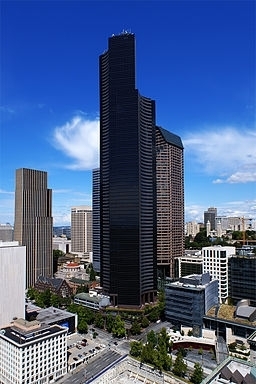 Columbia Tower: Full 360-degree view of sports stadiums, downtown, Puget Sound, Mt. Rainier, the Space Needle and more. Space Needle: You can reserve a date and time to visit the Space Needle, but you can't predict the weather. Part of the Space Needle is inside, but the observation deck is outside, so be prepared for the elements! Columbia Tower: You can enjoy the views within a climate controlled interior. Space Needle: Again, you can plan ahead for a date and time but the earlier you get there, the less need to plan ahead. The Space Needle is at the Seattle Center which has other attractions so the crowds will be bigger. Once you’re on the observation deck you don’t usually have to fight the crowds that much. Columbia Tower: Not nearly as crowded as the Space Needle. Columbia Tower: About a ten block walk or catch a bus at 5th Ave. and Pine St. The Columbia Tower is a great alternative to the Space Needle. Many people prefer it, but it may depend on what you want to experience. If you want to take your time and just enjoy the view in a climate controlled interior without paying as much, then the Columbia Tower is for you. If you want more of the excitement of the crowd, more engaging activities, and more a view of Lake Union then the Space Needle is the one to visit. Better yet, do both and tell us which you prefer!